On the second of August I attended the Peak Rail 1940s weekend at their heritage railway line near Matlock in Derbyshire. This event would feature not only re-enactors dressed as allies, but also as the Axis forces, which are rarely welcome at many other 1940s events for obvious reasons. The weather forecast for the event was not good to say the least. There was a lot of rain, and not very much light. This however, did create a fitting setting for the Axis forces and would generate much darker, grittier pictures. I chose to use Delta 400 pushed to 800 ISO, as this had produced good results in the past during dark or changeable conditions. The event featured many dugouts were soldiers were set up in battle positions. This provided an opportunity to photograph soldiers, or in this case comrades, together in their dugouts. 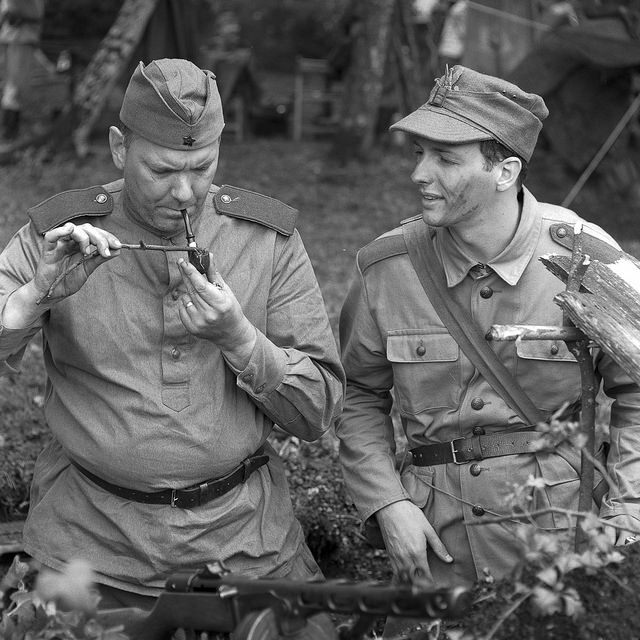 Two comrades lighting a pipe in the trenches at Peak Rail. Despite the grey, rainy conditions, this look fitted the subjects really well. The grainier look of the film suited the environments of troops working together in the woods. I was surprised how much contrast the shots managed to capture despite pushing the film for an extra stop. The expressions of the faces of re-enactors often adds just as much to the photographs as the environment and clothing. Finding the right people to photograph is one of the biggest challenges of trying to create images from another time. 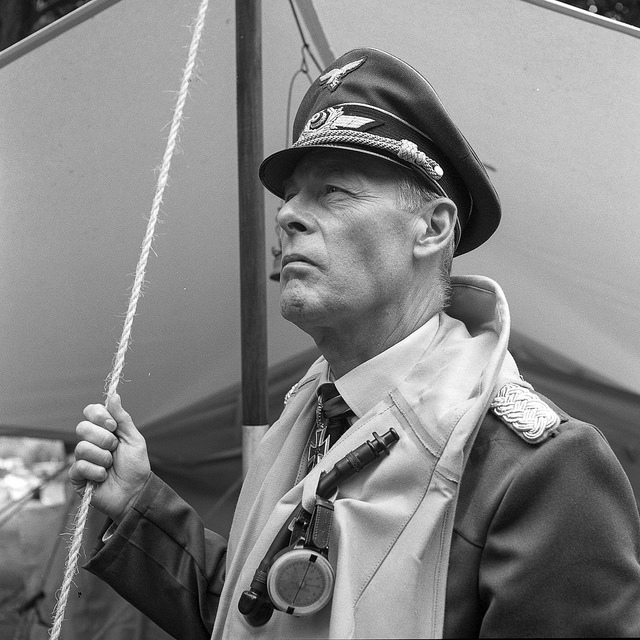 A German airman looking looking into the distance provided a fitting subject to photograph in the dark and gloomy environment under the trees. There is a distinct, sinister air to this image. The way that the camera has picked up the fine detail in the face has brought this image to life, giving a vivid and real feel to the photograph. The trees themselves often formed part of the photographs, with the wooded areas by the tracks providing a convincing backdrop to photographs of troops. The trees in the background provided a dark backdrop, with only a few pieces of light peaking through. The Bokeh contrasts well with the sharp details of the axis soldier. 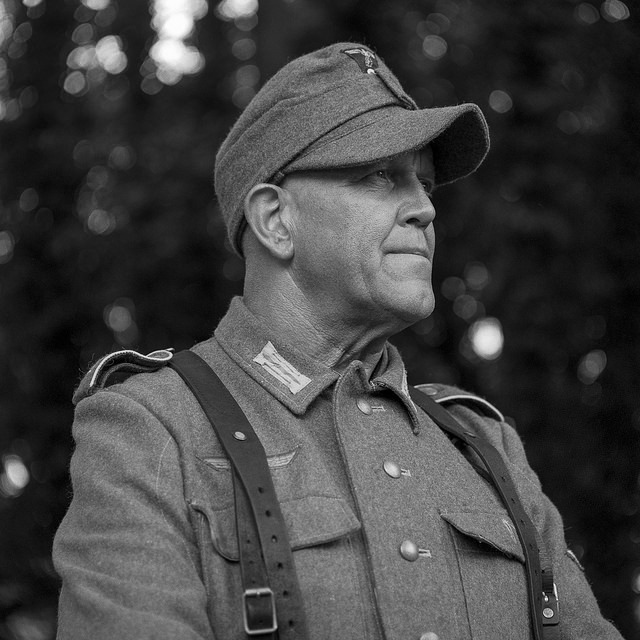 The low angle of shooting with a TLR has created a very strong, upright look to the soldier in the photograph. This gives a feeling of strength, similar to the silhouettes seen on German propaganda posters. I wanted to photograph soldiers with their weapons ready, and the Peak Rail event with it’s many dugouts and trenches provided just this opportunity. 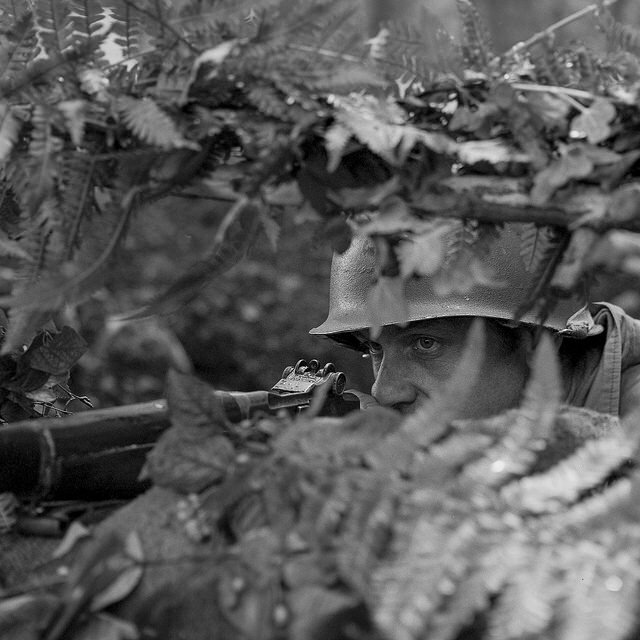 A soldier taking aim through the camouflage of his dugout. I really liked the intense, focused look on the soldier’s eyes. I felt that this image really stood out – the focus of the eyes, the depth of field blurring the leaves and the grain of the film. If feels as though the photographer isn’t even present, and that we are viewing a very intense moment as the soldier looks out for the approaching enemy. As part of the event there was a mock battle in the forest section. To photograph this, I used the 180mm lens to photograph the Russian, American and German troops use half tracks and artillery guns to fight each other under the trees. The 180mm lens provided just enough reach to get some images as the troops battled for victory by the tracks. 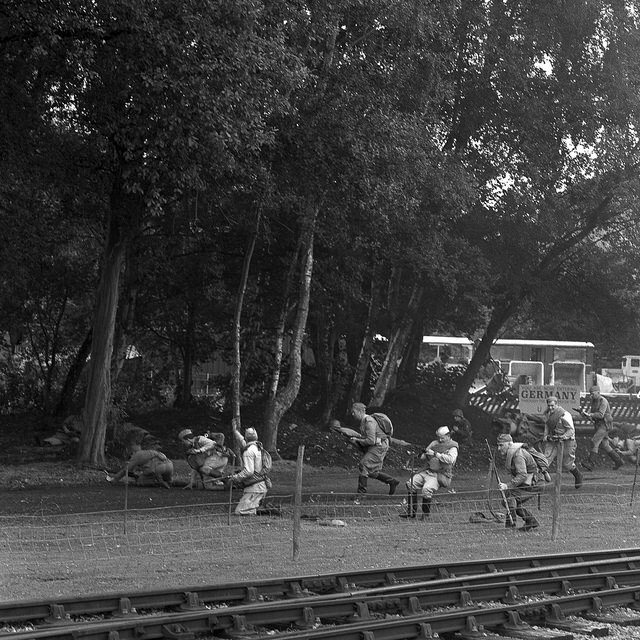 A Russian troop falls as his comrades fight by his side by the tracks at Peak Rail. I managed to capture the moment just as one of the troops was falling, and as another soldier signals to his comrades to move forward. This photograph really brings home the chaos of war as the troops fight for their lives as the Germans open fire on them. Despite the heavy rain the Peak Rail event produced some great photographs. If the weather had been better, I don’t think the images would have had the same dark, grainy look that I was after creating at the event. Pushing Delta 400 to 800 once again produced great results, and the Mamiya lenses as produced sharp images with amazing detail. I have an album on Flickr for my Peak Rail 1940s weekend photographs.